I never thought that it was possible to make such good pizza at home. 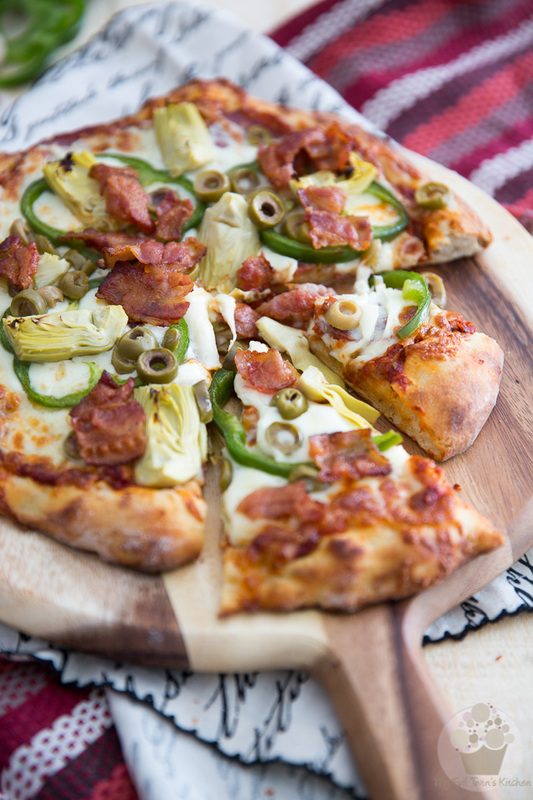 This is honestly, and by far, the Best Homemade Pizza I ever had! Let me explain: every so often, mischievous teens would place phony orders and have pizzas delivered to fake addresses or to people they “knew” and wanted to play a trick on. I don’t know whether this phenomenon still exists today with all the modern technology and tracking devices and all, but back then, it was surprisingly common. As annoying as it must have been to the owners, instead of trashing the superfluous pizzas, they would give them to their employees to bring home. Thanks to the little rascals, my dad would often come home from work holding one or two of the familiar square boxes in his hands, much to our delight! Needless to say that to this day, I still love me a good pizza on occasion! 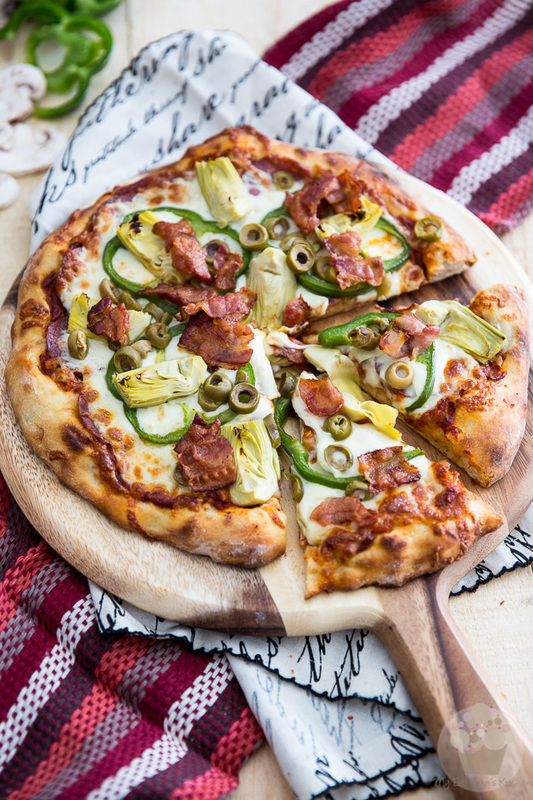 I tried many, many times to make a decent one at home, because you know, when I make my own, I get to choose exactly what toppings and how much of it get to dress my pizza. Truth be told, tough, I never was fully satisfied… UNTIL NOW! You see, the thing is for me, the crust is what totally makes or breaks a pizza. Sure, the sauce and toppings also have a big role to play, but if the crust isn’t right, then the whole experience is sort of impaired. When I have pizza, I DEMAND a crust that’s nice and chewy, thick but not so thick that it takes all the place, dense but soft and pliable at the same time, crispy and tasty, just like a good bread, with LOTS of nice large bubbles in it. Up until recently, I thought there was no way one could ever achieve such results at home simply because our ovens don’t get nearly hot enough. That was until I discovered the magical tool that’s known as a pizza stone!!! You place one of these babies in the oven to preheat for about an hour before you cook your pizza, so it has a chance to get really really hot, and you have a set-up that’s pretty comparable to that of the best pizzerias of this world. If you’ve not tried that yet, do it. You will not believe the difference that cooking your pizza directly onto a super hot stone will make. 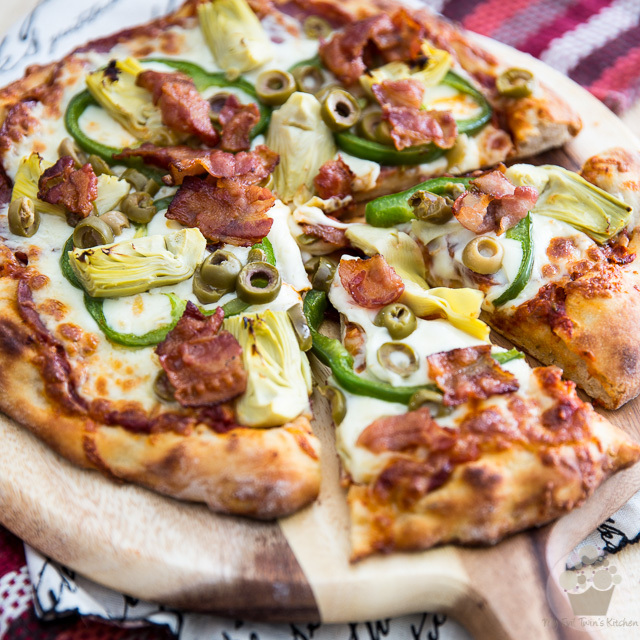 I didn’t include step-by-step pictures to make the pizza dough because frankly, I used the recipe exactly as it appears on King Arthur’s page, and that post is so concise and detailed, I felt it would be a total waste of time to repeat it all here. Besides, there was no way I could do as good a job as they did. So I figured I’d let you head on over to their site to make your dough. However, you might want to make a mental note that you need to get started the previous day, so your dough has chance to proof overnight, and that you will then need to give your dough a second proofing before you can use it, which will require about an hour this time. You will also have to make your pizza sauce, either the previous day or while your dough is proofing for the second time. For some reason, I apparently had a major brain malfunction and totally forgot to take pictures of that. Luckily, the process is extremely easy, so I’m sure you’ll make do without the photos. Also, if you can’t be bothered with making your own sauce, you could buy some off the shelves at your local supermarket. Honestly, there are quite a few decent ones to choose from, out there: this is my personal favorite when I’m in a pinch. When your dough is done proofing for the initial 24 hours, you’ll want to preheat your oven to 550°F and place your pizza stone on the middle rack. Leave your stone in there for about an hour so it has a chance to fully preheat. Like I said, cooking that pizza on a super hot stone is the secret to getting that crust baked to crispy perfection! While the dough is proofing for the second time and the stone is heating up, prep your garnish and par-cook your bacon: cut it into 1½” chunks and cook it until soft and chewy. I find a good way to do this is to throw it into a broiler pan and then place that pan directly onto your hot pizza stone for 2 to 3 minutes. 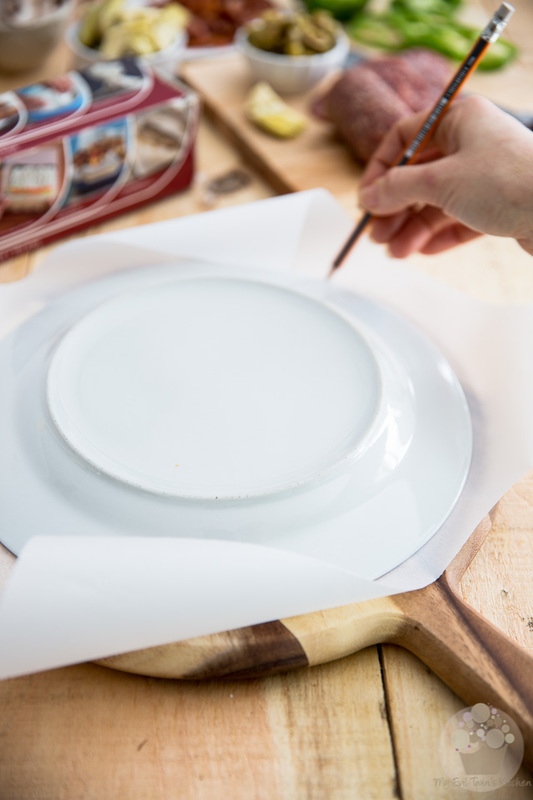 Next, use a large round dinner plate to trace 2 circles on parchment paper. You’ll be using these to place under your pizzas and ensure that they won’t stick to your pizza peel as you slide them onto the pizza stone. You could also dust your peel with lots and lots of flour, if you preferred, but I find this technique to be much more efficient, not to mention a lot less messy! 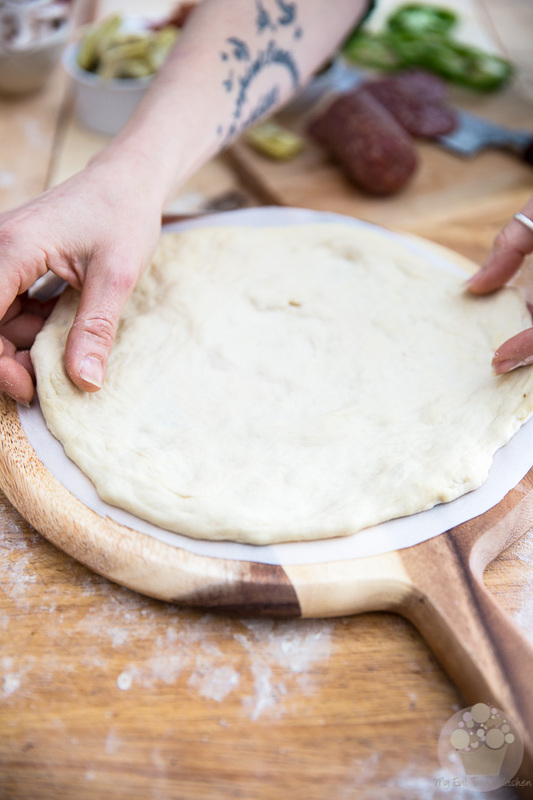 When your pizza dough is done proofing for the second time, delicately stretch each ball with your fingers until it’s approximately 10″ in diameter and then move the discs onto your prepared parchment paper circles. Divide the sauce between both discs and spread it in a thin even layer, not quite all the way to the edge. 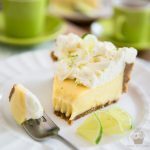 Make sure you don’t use too much sauce, as this would only end up making your dough soggy, and would most probably cause your precious toppings to slide off your pie. A thin layer is all it takes! followed with a generous amount of grated cheese. 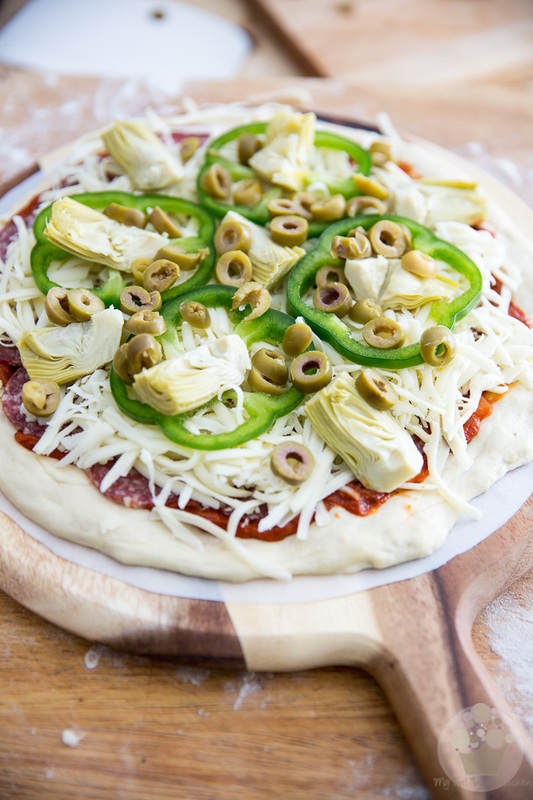 Finish with the sliced bell peppers, quartered artichokes and sliced green olives. 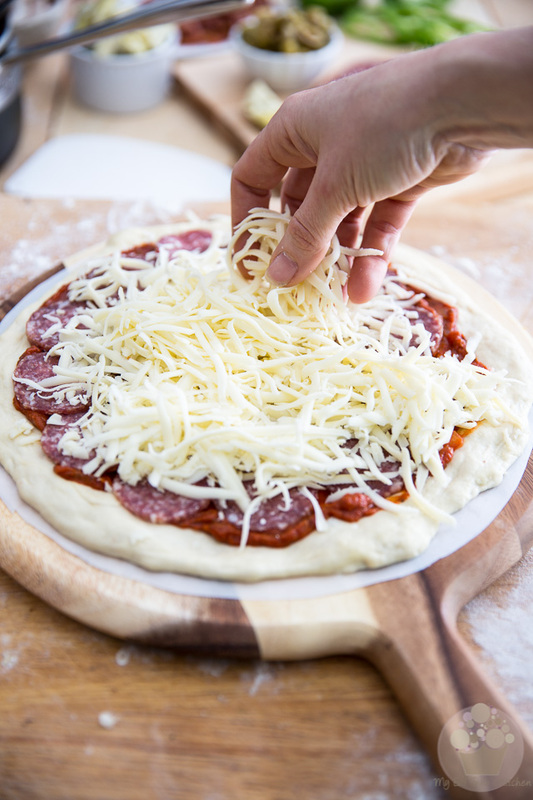 Delicately slide the pizzas (with the parchment paper) onto the preheated pizza stone and cook until the crust is poofy and brown and appears nice and crunchy, and the cheese is fully melted and starts to brown and bubble around the edges, about 8 minutes. Oh, and when there is about one minute left of cooking time, add the bacon so it has a chance to crisp up. One minute is all it takes, really. If you were to add it too soon, it would simply end up burning. Likewise, if you were to add it raw with the rest of the garnish, it would release all of its grease right on top of your pizza. Personally, I’m not a fan of greasy pizza, but if you don’t mind it, you can always go with that option! Finally, we’re ready to eat! Will you look at that crust!!! Now that’s what I’m talking about. That’s pizza crust perfection right there, if you ask me. 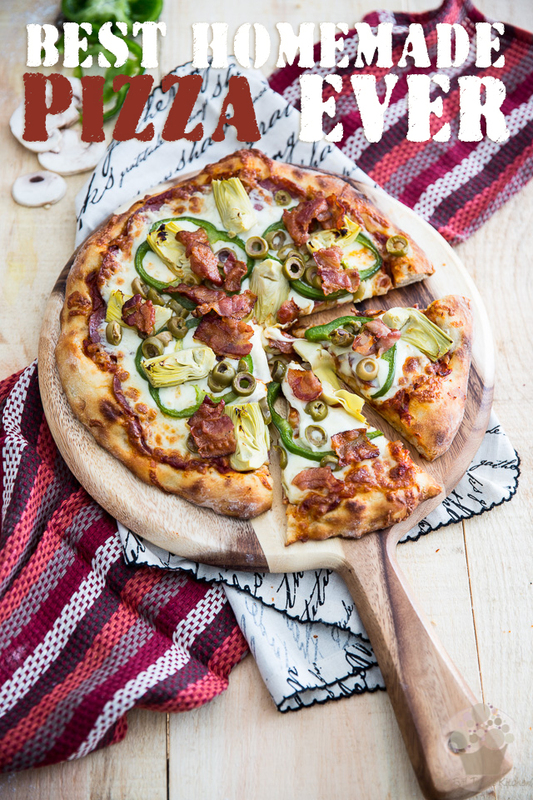 Frankly, I think they’re something particularly rewarding about making your own pizza, especially when it’s that good. I can’t wait to repeat the experience. 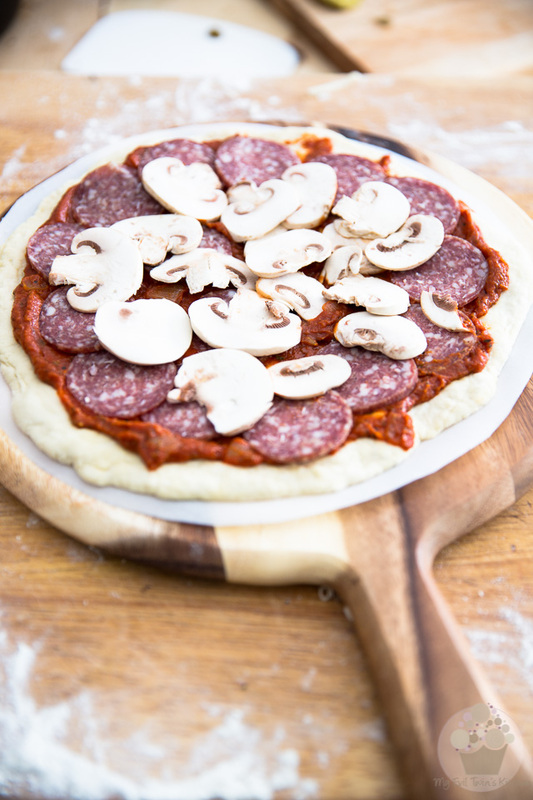 The previous day, get started on your pizza dough so it has a chance to proof overnight. To make the sauce, heat the olive oil in a medium saucepan placed over medium heat and then add the chopped onions, garlic and seasonings; cook until fragrant and the onions become translucent, 2-3 minutes. Add the crushed tomatoes and bring to the boil then lower the heat and simmer, partly covered, for about 15-20 minutes, or until the sauce is thickened. When your dough is done proofing for the first time, preheat your oven to 550°F and place your pizza stone on the middle rack. You'll want to leave your stone in there for about an hour so it has a chance to fully preheat. Meanwhile, get your pizza dough ready for its second proofing. While the dough is proofing for the second time and the stone is heating up, prep your garnish and par-cook your bacon: cut it into 1½" chunks and cook it until soft and chewy. I find a good way to do this is to throw it into a broiler pan and then place that pan directly onto your hot pizza stone for 2 to 3 minutes. When your pizza dough is done proofing for the second time, delicately stretch each ball with your fingers until it's approximately 10" and then move them to your prepared parchment paper circles. Divide the sauce between both discs and spread it in a thin layer, not quite all the way to the edge. Top with the salami, sliced mushrooms, followed with grated cheese. 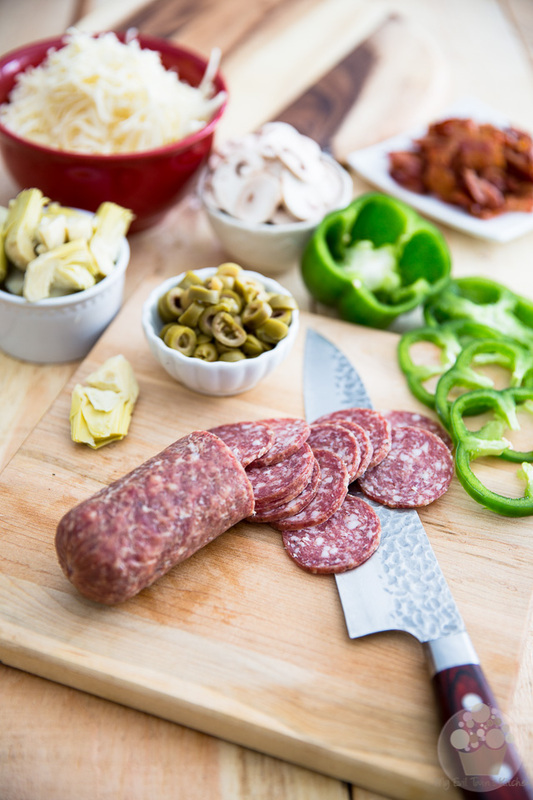 Finish with the sliced bell peppers, quartered artichokes and sliced green olives. 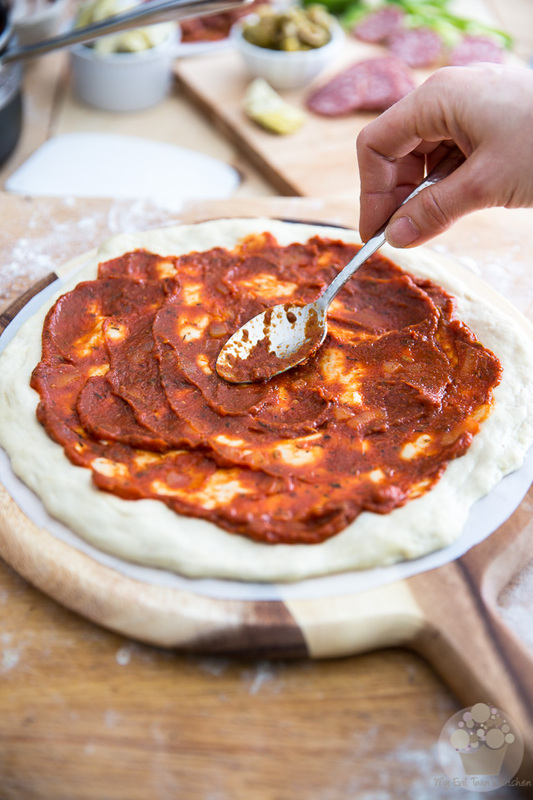 Delicately transfer the pizzas onto the preheated pizza stone and cook until the crust is poofy and brown and appears crunchy, and the cheese is fully melted and starts browning around the edges, about 8 to 10 minutes. When there is about one minute left of cooking time, add the bacon so it has a chance to crisp up. I have a pizza stone gathering dust! Motivated to break that puppy out tonite! Your pics are so beautiful…tutorial on photography for future project? Love your new site! Thank you so much for your kind words, Kathi! I’ll have to give the photo tutorial some thought… could be a fun project! I agree, that KAF pizza dough recipe is the best. I’m intrigued that you put some toppings under the cheese and others on top of it. My dad always did everything under the cheese. It seems most pizza places put them all on top of the cheese. Is there a particular reason? It sure looks delicious regardless. Oh, and if you ever get a chance to try a baking steel – do it. We sent our old pizza stone off to goodwill since we got one. Amazing results even better than a stone with the steel. Ha! I don’t know, it’s just a matter of personal preference, I guess. I like to put the toppings that cover the entire surface of the pizza under the cheese, and those that get “scattered” across it over my cheese. I just think it looks pretty that way, plus they get to brown and crisp up a bit in the oven, whereas those that are hidden under the cheese stay moist and soft. 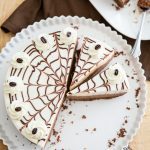 Been looking a different recipes on so many new sites! Saw THIS off your twin’s! I CAN’T have yeast and lots of other goodies- very restricted in what I can eat- cuz have so much INFLAMMATION & infection in my body! Health challenge leaves me w/limited mobility! But I do occasionally make myself “poor man’s pizza” under the broiler! (Yesterday, I forgot to lightly toast my GF bread first-so even tho the cheese was done the rest wasn’t! So today, when I saw this DELISH pizza—I WAS REMINDED TO ‘LIGHTLY TOAST MY GF BREAD IN TOASTER ONCE’ then it comes out more crispy! LIKE a pizza should taste! I also have a can of artichokes. THEY AREN’T MARINATED but I could start to marinate them in my olive oil and Italian spices UNTIL my order arrives that does have marinated ones in it! I LIKE MARINATED artichokes! Also, desire to order either some black olives or Greek olives! NOT suppose to eat all that vinegary foods-but I don’t eat very often! Now & then I may go out for a Greek Salad w/ friends! Finishing up my glass of Super Food Greens w/ added tonic & Mineral Water. 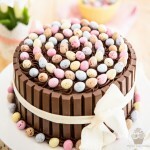 But while I am looking at al the PICS of DELISH food –I GOT TO EAT SOMETHING before going to the matinee 4pm!!! Keep up the GOOD work!!!! 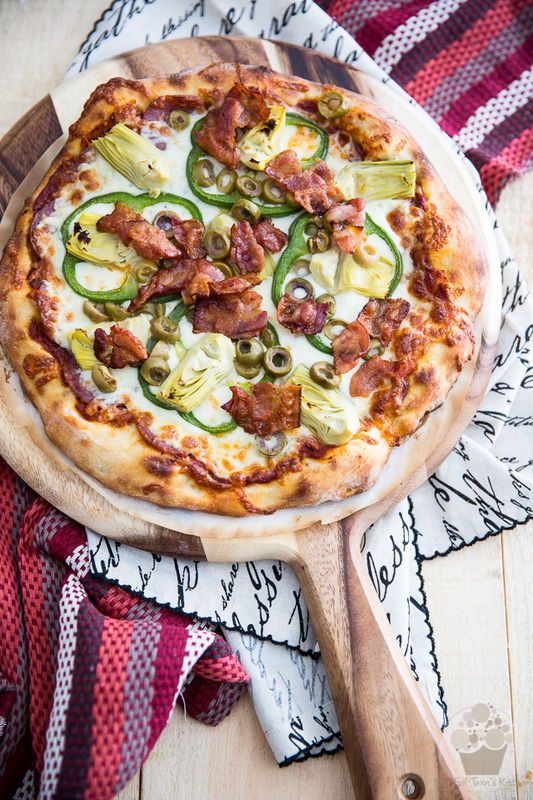 This is hands down the best homemade pizza recipe I’ve ever made. Thank you for sharing. I make this all the time. The flavor was unbelievable even without the bacon. . Best pizza ever pretty much says it all. Thank you for this incredible combination!